The Anterior Cruciate Ligament (ACL) is a very important ligament in the knee. ACL tears are the most common problems surgeons fix in dogs. Once the ACL tears, all kinds of consequences follow. 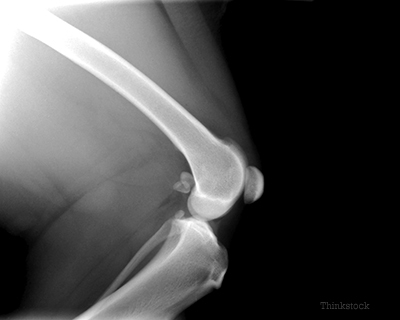 Let’s go over 10 possible consequences of an untreated ACL rupture. 1. Patients with any joint problems, such as a torn ACL or a dislocated knee cap, are classically in pain. Of course, pain medications tend to help and may even eliminate limping, but they do not fix the tear. As time goes by, pain may decrease to some degree, but it stills hurts, especially once arthritis sets in. 2. The older the injury, the more arthritis we see in the joint. And there is no cure for arthritis, it is a life-long condition. There is no such thing as “arthritis medication,” despite what many pet owners seem to believe. We can help with joint supplements, but we can’t fix arthritis. 3. Without surgery, the body tries to stabilize the wobbly knee with scar tissue. Unfortunately, this is hardly ever strong enough to keep the knee stable. 4. This scar tissue limits range of motion. The more scar tissue, the stiffer the joint — the dog or cat cannot bend or extend the knee all the way. 5. Not using the leg classically leads to various degrees of muscle loss (muscle atrophy). 6. It’s tough to run around with a sore knee, whether you’re a family pet, a couch potato or a working dog. This leads to exercise intolerance as the conditions above worsen. 7. When the ACL tears in one knee, weight shifting and other factors may lead to a tear in the opposite leg. While this may be manageable in a small breed such as a Yorkie or a miniature poodle, it becomes a much bigger problem for a large breed dog such as a Labrador or a Rottweiler. 8. Up to half of dogs with an ACL tear end up with a tear of the meniscus, which is an important piece of cartilage in the knee. That tear causes more pain and more of the consequences above. 9. Many of the above changes lead to decreased activity, which typically causes weight gain. 10. The changes in gait and posture can affect all three other limbs, as well as the spine. Ten consequences of an untreated, torn, ACL are bad enough, but it gets worse! Several vicious cycles set in after the ACL tears. For example, pain leads to lameness, which leads to poor use of the leg, which leads to muscle atrophy. Inactivity leads to weight gain, which leads to more pressure on the joints, which leads to pain. From a surgeon’s standpoint, an ACL tear is a very fixable problem. Sure, it is possible to survive with a torn ACL. Sadly, it may be the only option if you absolutely cannot afford surgery. However, if you can afford surgery, it will dramatically improve your dog’s (or cat’s) quality of life.